So the black year of 2016 had one final kick in the teeth for us after all, as news came through on Christmas Eve that Status Quo’s Rick Parfitt had left us, just when it was beginning to look like nothing could bring him down. The news came just a day after his old colleagues had played a show at Liverpool Echo Arena, the last date of the ‘Last Night Of The Electrics’ UK tour. He was of course fully intending to perform when these dates were announced, but in June of this year following a show in Turkey, he was hospitalised and it was later revealed that he had actually ‘died’ for a few minutes. The band, with dates to honour, continued with a stand-in guitarist (Freddie Edwards, son of bassist Rhino Edwards initially, then Ritchie Malone took over the role), but by September it was announced that Rick Parfitt had officially stood down from live performances as a result of his condition. He had seemed to be on the mend, with plans for an autobiography and even a new album of recorded material in the pipeline, but what took him in the end was septicaemia, from complications arising from an earlier shoulder injury. One of rock’s most enduring figures, his hard style of rhythm guitar inspired many others to pick up the instrument. Parfitt joined up with founding members Francis Rossi and Alan Lancaster in 1965, in The Spectres who later became Status Quo. After some initial success (most notably with the psychedelic hit ‘Pictures of Matchstick Men’) they changed style, finding that a straight-ahead, no-nonsense boogie sound had got crowds rocking they pursued that direction, scoring chart hits beginning with ‘Down The Dustpipe’. They went on to become regulars in the UK chart, and were frequently seen on BBC TV’s ‘Top Of The Pops’. The group still hold the record for the most appearances on that programme, which was cancelled in 2006 following a 42-year run on screen. By the early 1980s the Quo were one of the biggest rock bands in the UK, they even headlined at the Monsters of Rock festival at Donington Park in 1982. By then the cracks had started to appear; drummer John Coghlan had quit the previous year to be replaced by Pete Kircher, and although the hits kept coming, by 1984 the group announced their retirement from touring with a ‘farewell’ UK tour. This culminated in a huge show at Milton Keynes Bowl in the summer of 1984, and although frontman Francis Rossi declared from the stage at that show ‘We are not splitting up – we will still be a band as normal!’, a split was nonetheless perceived. By this stage bassist Alan Lancaster had relocated to Australia, and they had to be persuaded by Bob Geldof to open proceedings at a fundraising concert he had organised in July 1985, to aid the famine relief effort in Africa. Live Aid proved to be their revival, given the opening slot their performance was carried by television networks the world over. It was a masterstroke by Geldof to get Quo to start the whole show with their cover of ‘Rockin’ All Over The World’, and they performed two more numbers before making way for the next act. The next year, Rossi and Parfitt had decided to give Quo another shot, but without Lancaster (or Kircher), recruiting new personnel for their 1986 ‘comeback’ album ‘In The Army Now’. That album was a success and despite their earlier retirement, they took to the road once again and have toured regularly ever since. Parfitt was the ultimate rock star who lived the dream, perhaps a little too hard, and in 1997 it caught up with him when he was admitted to hospital and underwent a quadruple bypass operation. He took on board doctors’ advice to curtail his hard partying, and after a period of rehabilitation he resumed work with Quo. He had several other scares in subsequent years, but had returned from them all, giving him a reputation of being near-indestructible. He continued to perform with Quo right up until June this year, when his most recent heart attack finally forced him off the road. Some of Quo’s fan favourites were written and sung by Rick Parfitt, and in closing this post a few are presented. He is already missed; the Quo’s gig at Liverpool without him was still good, but it took the entire band to up their game in order to compensate for the blonde, Telecaster-wielding icon now no longer on stage alongside his compadre Francis Rossi. The shocking news of long-time Quo guitarist Rick Parfitt’s death has overshadowed the events of this gig, which took place the previous night. A full blog post commemorating his music will follow, for the time being this review (which had already been started when the news broke) relating to the final show of 2016 by his old band is dedicated to his memory. This tour was announced way back in March of 2016, so long ago that I and my friend who had actually booked this show almost forgot about it! A lot has happened since the dates were announced, when it was declared that this would be Quo’s last full-on ‘electric’ tour. 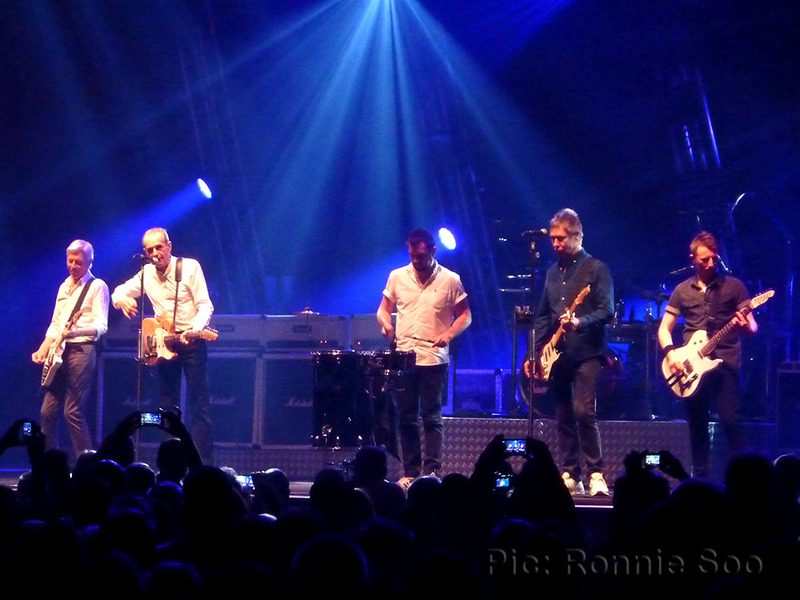 The success of their ‘Aquostic’ and ‘Aquostic II’ albums (featuring acoustically-styled reworkings of the band’s classics) has prompted frontman Francis Rossi to pursue that direction in future, and with the guys now getting on in years now he may feel that five decades touting a Telecaster is quite enough. However he could not have foreseen that his old partner Rick Parfitt would have been forced to retire from the road by the time these dates came around; having (barely) survived yet another heart attack he immediately called time on live performances. With dates still to fulfil, the group first drafted in Freddie Edwards (son of Quo bassist John ‘Rhino’ Edwards) on rhythm guitar, before settling on Ritchie Malone to take over one of the most thankless tasks in rock. 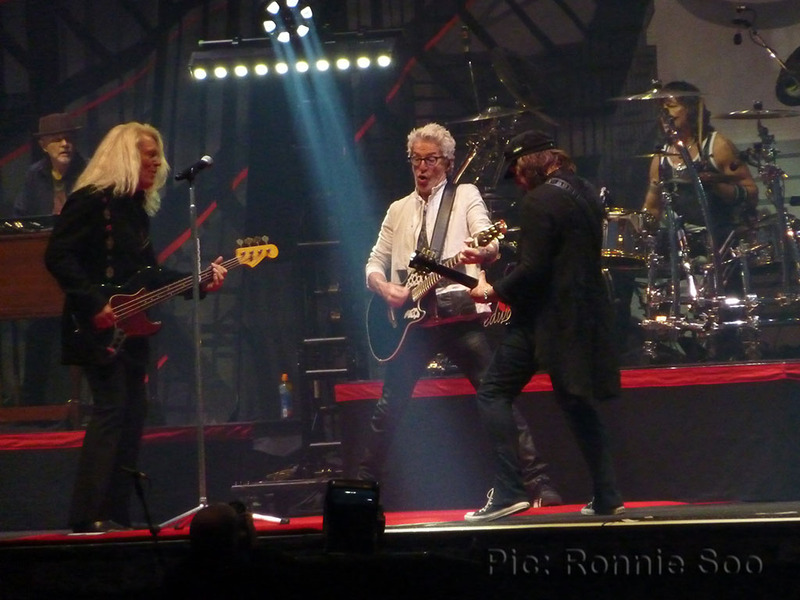 The Quo have often found room for a date in Liverpool on recent tours, they were here at around the same time last year, complete with Parfitt on the now ironically-titled ‘Accept No Substitute’ tour. In May of this year they performed at nearby Prenton Park on the Wirral (home of Tranmere Rovers FC) in what would prove to be one of Parfitt’s final live performances. Their support acts are usually worth a look themselves; the likes of 10cc and Wilko Johnson have supported in recent years and for this run of dates, they brought along veteran American act REO Speedwagon. That in itself was of interest to me as I’d never seen that band before, despite their having been around for almost as long as Quo have. Before all of that, as I and my friend entered the arena there was another act already on stage. 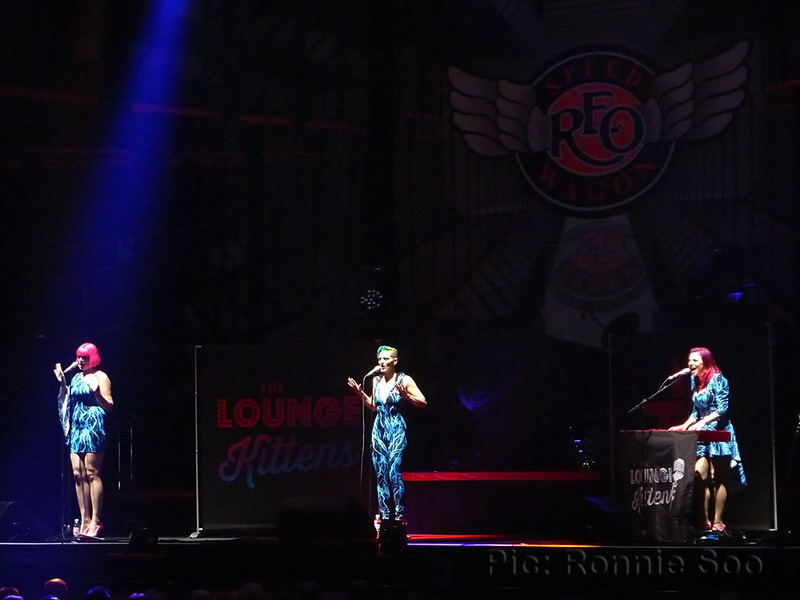 Three female singers calling themselves The Lounge Kittens were performing what appeared to be totally inappropriate lounge music, however the penny quickly dropped that they were singing hard rock/metal favourites in a three-part harmony style, and I had to laugh when I worked out that they were covering ‘Rollin’ by Limp Bizkit! One of the singers (Jenny Deacon) also plays electric piano, the only instrument used aside from their voices. They even had the nerve to deliver a superb take on Quo’s ‘Pictures of Matchstick Men’ before closing with a medley of classic rock hits, starting and ending with Queen numbers (‘Fat Bottomed Girls’, then ‘We Are The Champions’) and taking in such hits as ‘Alone’ (full marks to them for doing that one; Jenny Deacon came close to the power of the great Ann Wilson herself there). I will definitely look out for these girls again, they put a smile on the faces of the early arrivals. REO Speedwagon arrived next, as a battery of drums from aptly-named drummer Bryan Hitt led into a storming ‘Don’t Let Him Go’ from their breakthrough ‘Hi Infidelity’ album. Frontman Kevin Cronin is almost unrecognisable from his 1980s heyday, the big hair of those days now replaced by a neater crop of grey hair. However his voice has held up well considering he must be in his mid-sixties at least by now, and the group were surprisingly harder-hitting live than their hit records might suggest. The ten-song set included many of their favourites, with ‘Take It On The Run’ coming second song in. A speech from Cronin followed, expressing some surprise that this was their first time ever in Liverpool, and naturally namechecking the Beatles as influences (this band are of the generation to have been directly influenced by not only the Beatles, but also many other British bands of that era who struck gold in America during the 1960s). The singer went as far as to claim that had it not been for the Fab Four, he wouldn’t have written any songs let alone hits such as ‘Can’t Fight This Feeling’ which was subsequently performed. They even covered ‘I Saw Her Standing There’ in a harder-rocking style than perhaps some would have expected. Next came one of my favourites of theirs: ‘Back On The Road Again’, with vocal from bassist (and writer of this track) Bruce Hall. This was the heavier part of the set, as Cronin next dedicated ‘Ridin’ The Storm Out’ to the late Gary Richrath (the long-time guitar player for this band). Current guitarist Dave Amato gave a fine performance, rocking hard where appropriate and playing with tasteful restraint otherwise. Cronin took to the piano next to perform their best-known hit in this country ‘Keep On Lovin’ You’, before closing out with the epic ‘Roll With The Changes’. They may have left it late to play their biggest tour in this country to date (albeit as a support band) but they went down very well with the Liverpool audience, and it’s to be hoped they do return to these shores again soon. The announcement earlier this year that Quo’s winter tour would go ahead without Rick Parfitt disappointed some fans, who took up the option of a refund on their tickets. However the band were committed to the dates, and in a similar position to AC/DC who also had to continue their tour minus a key member this year. Quo’s decision to bring in a relatively unknown musician in the shape of Ritchie Malone was probably a wise move, a bigger name (if one were available) may have turned this tour into a circus. It was clear from the off though, just what big shoes Parfitt’s are to fill. Opening with ‘Caroline’, the onus immediately fell on the stand-in to power out the opening chords. There was nothing wrong with his playing, it just felt a little bit empty without that mighty presence on the rhythm guitar. I also suspect he was not as high in the mix as might be expected, it was noticeable that keyboardist Andrew Bown and bassist Rhino Edwards were more prominent in the sound balance than has been the case previously. There was a definite feeling of these guys ‘stepping up to the plate’ to try and make up for Parfitt’s absence; second song in ‘The Wanderer’ saw Bown take over Parfitt’s vocal part (and demonstrating a better singing voice than that of Rossi, if the truth be told!) while it was Edwards who took lead vocal for ‘Rain’ (one of Parfitt’s signature songs, and it was something of a surprise to me that they elected to play it). A treat for older fans came when Rossi declared (after some of his usual banter with the crowd) they would play ‘Softer Ride’. Another old favourite (‘Hold You Back’) had some of the crowd swaying in the aisles, before the inevitable medley. Medleys are not my thing in truth, but the Quo have done them for as long as I can remember, even dating back to the time when they headlined at Donington. (For younger readers, I am not joking – Quo headlined at Donington in 1982. They did, I saw it!) ‘Gerdundula’ has now become a live staple, as the whole group including drummer Leon Cave come out to the front of the stage. Without Parfitt alongside him, Rossi has had to adjust; Malone takes a much lower profile, often positioned at the back alongside the amps and the frontman was seen ‘conferring’ with Rhino at times as well as the other guys in the way he used to do with Parfitt. Quo were always seen as Francis, Rick and ‘the other guys’ since relaunching the band in the 80s, but now it does come across as more of an ensemble. That’s probably unfair on Rhino, a member of the band since 1986 as well as Bown who has been an official member for 40 years but that is definitely the perception of this new-look Quo. The hits such as ‘Roll Over Lay Down’ and ‘Whatever You Want’ (another Parfitt signature, again it was Bown who handled his vocal part) kept the crowd bouncing before main set closer ‘Rockin All Over The World’. The encore featured ‘Burning Bridges (On And Off And On Again)’ and traditional closer ‘Rock and Roll Music/Bye Bye Johnny’ before the group took their bows for what was claimed to be the last time in this guise. The band have since announced a further run of electric dates (including some festivals) for Europe in 2017 though, so it may not be the last time we see the Telecasters on the stage just yet. To conclude, this was a very good performance under tricky circumstances by the Quo, Parfitt is one of the great rhythm guitarists in rock, and without him there the difference is marked, but they worked around it well. If they do carry on in this guise into next year, and they come this way again, I’ll be back.